When your child comes to Adventures Preschool Children's Center, they will be provided with a delicious morning and afternoon snack, including milk and juice. For lunch, Adventures will still provide milk or juice, and parents will provide food for their child whether through packing a lunchbox or participating in our lunch program. 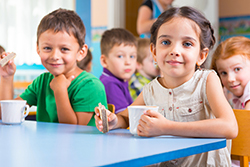 This allows parents to determine exactly what their child should or should not be eating!